Hyssop - Hyssoppus officinalis - Perennial - Culinary, Medicinal - Pretty plant with a refreshing scent often used as a perfume base. Attracts bees and butterflies. 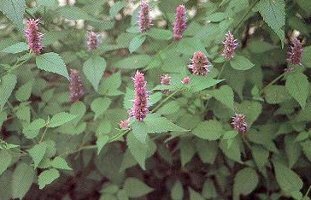 In the ancient middle east, hyssop poultices were used to treat herpes infections. Modern herbalists use it most often to treat colds, sore throats and tonsillitis.